Manifold systems are widely used with underfloor heating and this same principle can be applied to wall hung radiator systems. 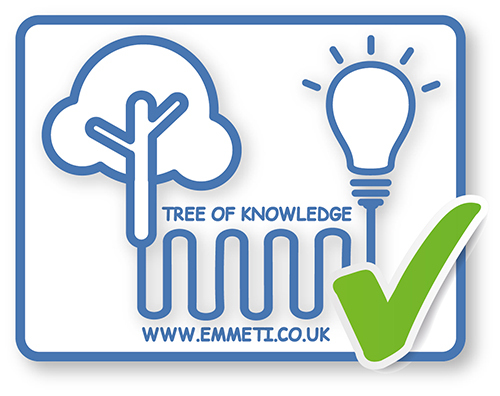 By using an Emmeti manifold system in a point to point configuration you can greatly reduce the number of joints in your system, speeding up installation time and vastly reducing the chances of a leak. Conventional heating system design relies on a large bore 22-28mm flow and return (commonly in copper) installed in a ring circuit with smaller bore 10-16mm feeds to each radiator to ensure even flow is achieved. This type of system can be time consuming and disruptive to install; has high material costs and can be difficult to balance and control correctly. By using a manifold system, the large flow and return pipework is minimised and allows smaller bore, more flexible pipework to be used, making it ideal for new build construction as well as refurbishment, in both domestic and commercial projects. Taking this approach a step further by using one of our Type 2 range of manifolds, which enables independent time and/or temperature control of each individual room or zone in the building. 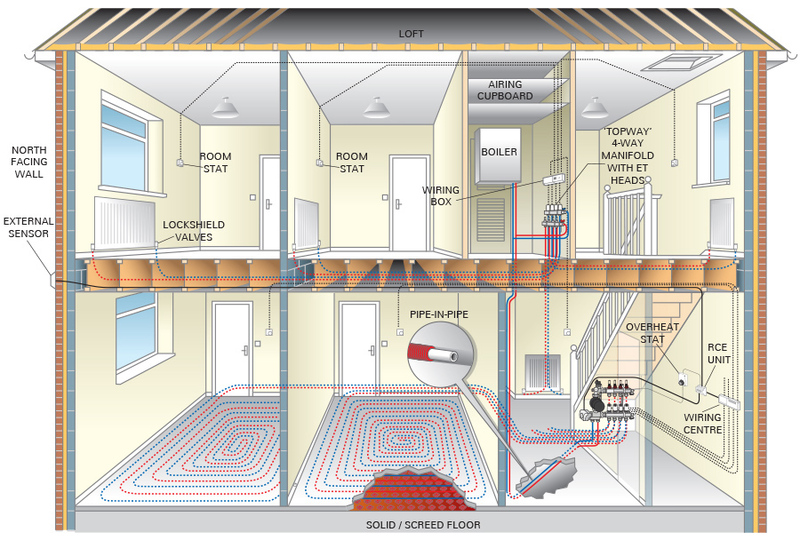 This allows the home owner or building occupier to tailor their heat to suit their lifestyles. This is proven to be a more accurate method for maintaining a comfortable temperature within a space as each thermostat is mounted in an optimum position rather than TRVs (Thermostatic Radiator Valves) which are fitted directly to the radiator at low level. The use of a thermostat per room/zone makes it much easier to create ideal comfort levels and prevents the unnecessary heating of unoccupied rooms improving the energy efficiency of the building by up to 40%. (Research carried out by TACMA (the BEAMA Controls Group) at Salford University). Type 1 (T1): These are distribution manifolds which are designed for wall hung radiator (WHR) systems with a Thermostatic Radiator Valve (TRV) and Lockshield valve (LS) on the radiator. Type 2 (T2): These are distribution and control manifolds which are designed for either wall hung radiator or underfloor heating (UFH) systems. The manifold is fitted with an electrothermic valve on the return bar and double regulating lockshield or flowmeter on the flow bar to balance and control each radiator; this replaces the TRV and lockshield on a radiator. The electrothermic valves are controlled by a thermostat or programmable thermostat, via a wiring centre. 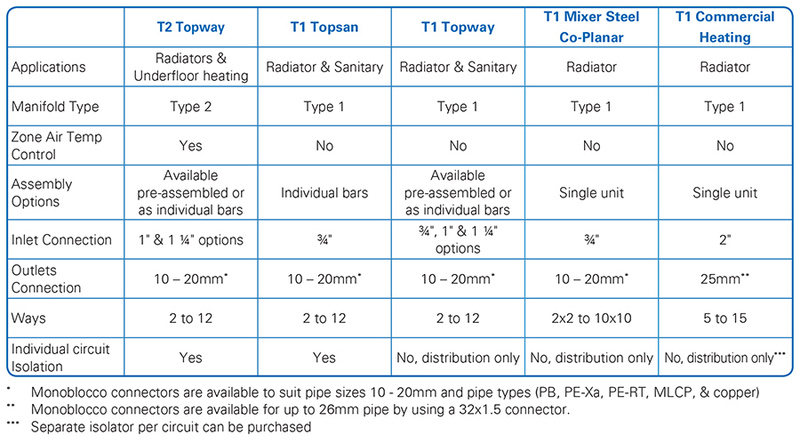 Type 3 (T3): These are commonly underfloor heating (UFH) systems only but can be used for radiator systems and have a temperature controller and pump to ensure that the water is at the correct temperature for the underfloor heating circuits, and there is sufficient flow for the greater length of pipe used. Find out more about Wall Hung Radiator Manifold Systems on our application pages.